When Jamison Vaughn—billionaire real estate mogul, Virginia vineyard owner, and unsuccessful U.S. presidential candidate—drives his gold SUV into a stone pillar at the entrance to Montgomery Estate Vineyard, Lucie Montgomery is certain the crash was deliberate. But everyone else in Atoka, Virginia is equally sure that Jamie must have lost control of his car on a rain-slicked country road. In spite of being saddled with massive campaign debts from the recent election, Jamie is seemingly the man with the perfect life. What possible reason could he have for committing suicide . . . or was it murder? Before long Lucie uncovers a connection between Jamie and some of his old friends—an elite group of academics—and the brutal murder thirty years ago of a brilliant PhD student. Although a handyman is on death row for the crime, Lucie soon suspects someone else is guilty. But the investigation into the two deaths throws Lucie a curve ball when someone from her own past becomes involved, forcing her to confront old demons. Now the race to solve the mystery behind the two deaths becomes intensely personal as Lucie realizes someone wants her silenced . . . for good. 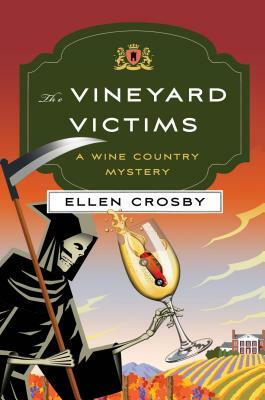 The Vineyard Victims is a nominee for the 2018 Mary Higgins Clark Award.